Polyester/cotton fabric Popper front opening 2 x chest pockets 2 x side pockets & 1 bac.. This pre-shrunk, top quality fabric contributes to the professional appearance of this garment. 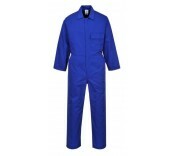 ..
EN ISO 11611:2007 Class 2 A1+A2 EN ISO 11612:2008 A1+A2 B1 C1 F1 330g flame retardant cotton ..